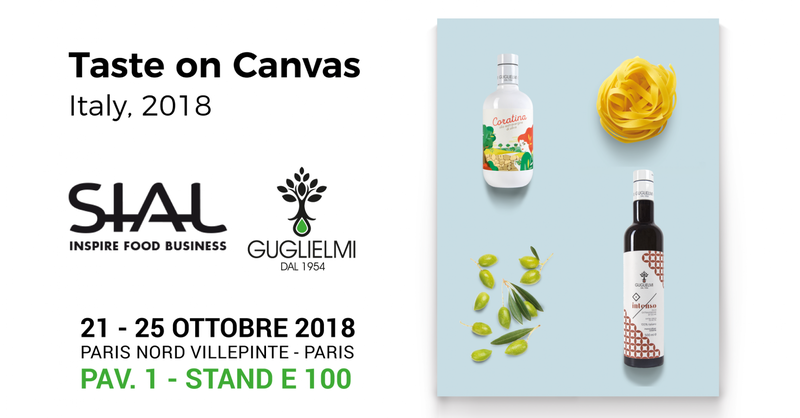 The “International Food Exhibition – Sial 2018” comes back from 21 to 25 October in Paris Nord Villepinte. This year focus topic is innovation in the field of nutrition. A theme that has always been very important for our company which takes part in the event with its stand at Hall 1/E100. Olio Guglielmi, since the year of its foundation in 1954, has always combined the ancient traditions of Puglia with an ever evolving work activity. Today we keep this concept going. The technological revolution in the oil creation processes and the preservation of the past generations teachings, lead to the yield of an authentic and genuine-flavored extra virgin olive oil. This is our innovative vision. By thinking about innovation came the “Taste on canvas” project. Will it be possible in the future to make our “art” of making oil virtually taste? Probably yes. Meanwhile, inspired by one of the most famous European art cities in the world, we offer you our personal tribute to the beauty of culinary art: tasting our extra virgin olive oil by involving all the senses. We are waiting for you from Sunday 21 until Thursday 25 October at Pavilion 1 stand E100 for a customized tasting.